Sidenote: Read all the way to the bottom for a sweet giveaway with Hodgson Mills! To say these were a hit with friends would be a gross understatement. After forgetting to take them to a friend gathering last weekend, we ended up having a few friends over anyway later in the night. The intention was to mix drinks in the kitchen, then move to the living room, where everyone could ogle over the cat (he is quite popular around these parts). Ended up, we all stayed in the kitchen and ate one two or more of these. I even had a claim that ” I would marry you for these” so I think they were a win! At the end of the night I even sent everyone home with a to-go bag of a couple cookies each, especially since we didn’t need the whole batch hanging around our house, being all tempting and chocolate covered and whatnot. 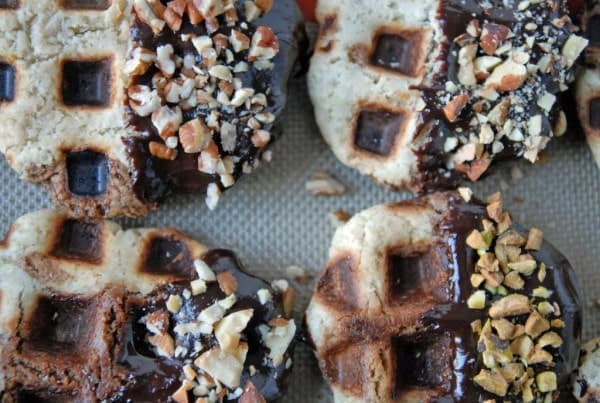 The basic process of these is that you take chocolate sugar cookie dough, smoosh it in with vanilla sugar cookie dough, and cook it like a waffle. You need to make sure you spray the waffle iron really well with non-stick spray (I love the coconut oil spray from Trader Joe’s) and keep an eye on it to make sure they don’t burn super fast. The best temperature seemed to be on medium/medium high, resulting in crispy cookies with a gooey center. I was really skeptical of this method at first, taking to Google to see if anyone else had successfully made cookies this way before. Most of the results were not favorable, but were made with chocolate chip cookie dough, so I figured I was golden, right? Even though I almost didn’t make these due to fear that they wouldn’t turn out, I am SO glad I did. 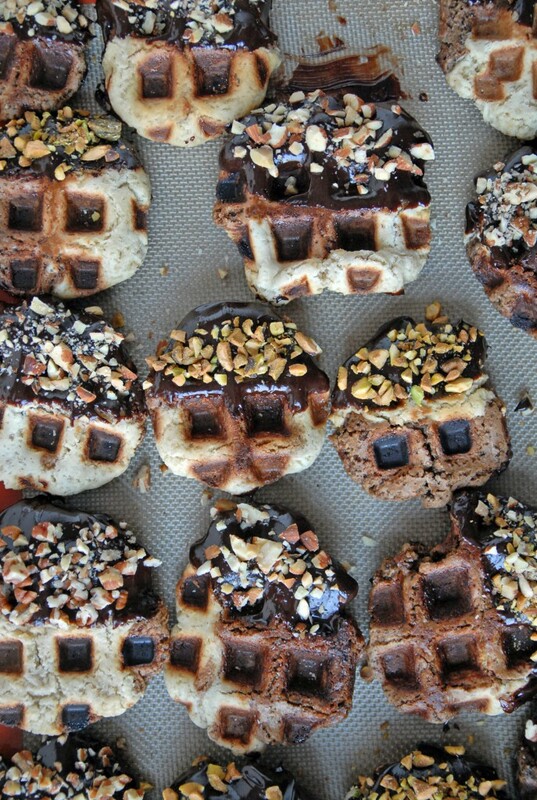 Dip them in chocolate, sprinkle with nuts, and call it a waffle cookie filled day! Want to win some of Hodgson Mill’s amazing products? We have a prize pack for you! Leave a comment below telling me your absolute favorite gift you have ever received, that’s it! Giveaway ends on Sunday at 10pm CST. This recipe was created in conjunction with Hodgson Mill as part of their ’25 Days of Grain’ Sweepstakes (http://bit.ly/25DaysOf). Find a coupon for a 5 lb. bag of cornmeal or flour here: (http://bit.ly/GrainSavings). Prepare the cashew cream for each batch of dough by blending all ingredients together until smooth. Scrape from bowl of food processor, place in small bowl and set aside. Combine all ingredients except for the cocoa powder for both types of dough in a large bowl of a stand mixer. Add in cashew cream mixing thoroughly. After dough comes together, remove half of the dough from bowl and set aside. With the remaining dough in the bowl, add in cocoa powder and mix until combined. Place both sets of dough (the vanilla and the chocolate) into separate bowls and refrigerate for at least 2 hours. Heat waffle iron to medium/medium high, thoroughly spraying with non-stick spray. 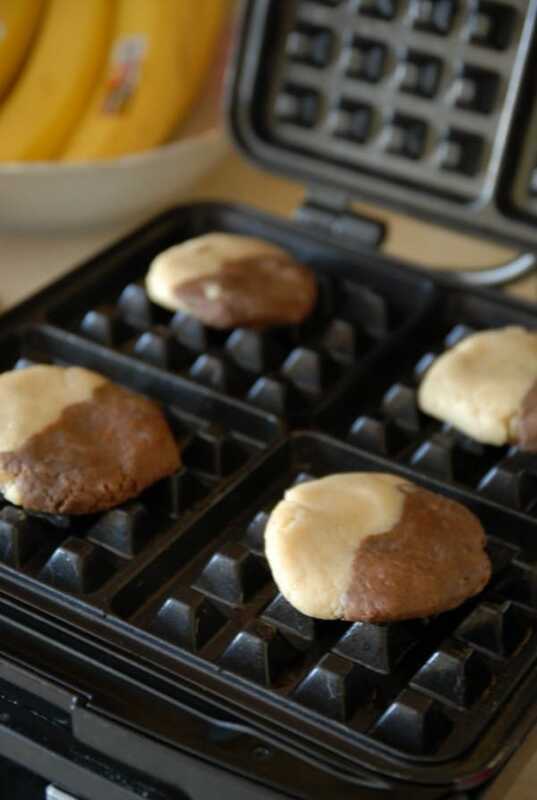 For each waffle cookie, press together 1/3 cup vanilla cookie dough and 1/3 cup chocolate cookie dough. 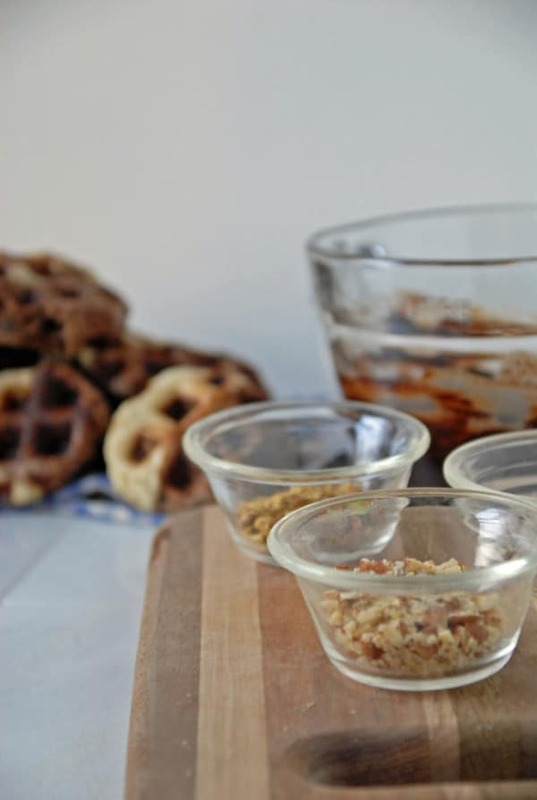 Press down waffle iron and cook the cookies until crispy on outside, about 3 minutes. Check cookies to ensure that they are not burning or sticking. As cookies are baked, set aside to cool on cooling rack. When cookies are cool, dip in melted chocolate and sprinkle with nuts. Set aside for at least an hour to allow chocolate to solidify. Store at room temperature for up to a week. These look amazing. 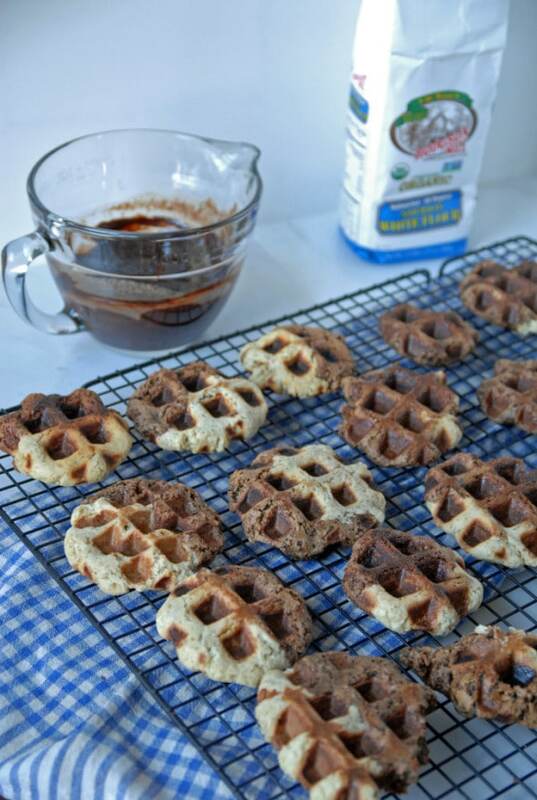 I’ve never made waffle cookies, but that will have to change. My favorite gift? I couldn’t pick one, other than just spending time with family at Christmas. Since I have a June birthday, many of my birthdays were spent traveling on family vacations so those were always the best gifts/ experiences! My absolute favorite gift was a ticket to see Mama Mia live on stage with my best friend! Merry Christmas, cannot wait to make these! My favorite gift was a set of matching flannel penguin pajamas my mother-in-law got myself and my husband! Favorite gift I have ever received would be a trip to Mexico that my sister surprised me with. Amazing and genius cookies! My favorite gift was my SLR Canon Camera! I love photography and it makes taking pictures so much fun! My favorite gift I’ve ever received is the claddagh ring my best friends gave me for my 21st birthday! I had lost it month’s before and couldn’t afford a new one. I haven’t taken it off since then! 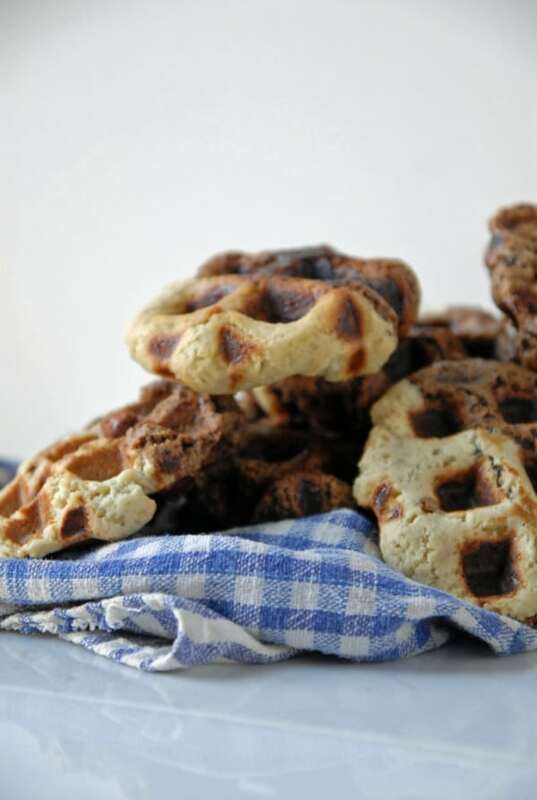 Seeing this recipe makes me wish I hadn’t tossed both my waffle makers in a fit of rage one day when my waffles weren’t turning out on either one. My absolute favorite gift was in 1987 when my grandma surprised my brother and I with a Nintendo. We became the coolest kids on the block, everyone started spending time at our house after school. The funniest is part is that neither my brother nor I knew what a Nintendo was when we opened it. Back then my grandma used to hang out with a lot of teenagers (long story) and they recommended that she get it for us. Thanks for this recipe! Definitely going to try this one. My favorite gift ever was a surprise personalized photo book of me and my fiance- not for Christmas, an anniversary, or a bday…just because! My best gift was a plastic gray and purple stereo system that I received in high school! oh my… Waffles AND cookies??? You totally have me 🙂 These look wonderful! My best gift ever was definitely a surprise visit from family! mine was my macbook! I live on it! I think there must be a typo in this recipe. Your cashew cream calls for FOUR CUPS of water to one cup cashews. It makes like a cashew milk. I thought maybe you just thought of cashew cream differently, but I’ve only added half of the liquid to the rest of the dough and it is already more like pancake batter than cookie dough. Unfortunately, I think I have to scrap the whole thing now (which is a lot of ingredients) because I can’t really figure out a way to rescue what’s there. Is it supposed to be four ounces? I am so sorry about that, I was thinking of the amount of water used to soak the cashews. The recipe has been corrected. Oh my gosh, do I even have to SAY how amazing this recipe is? 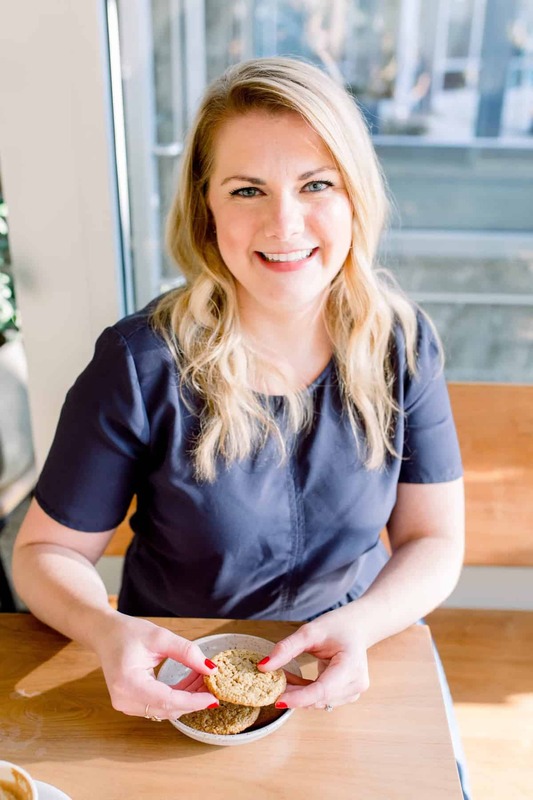 And thanks for the info on cashew cream — I prefer to bake without oil and hadn’t yet found a good substitute that makes cookies come out with the correct texture. Definitely going to have to try it now!